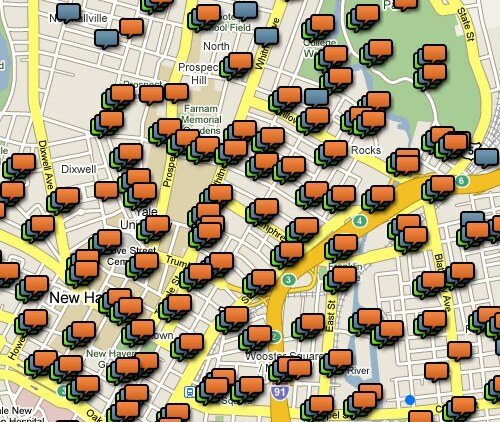 SeeClickFix, founded in New Haven, Conn., allows users to report issues about problems in their community. Giant potholes on your route to work? Obstructed views of oncoming traffic? Broken sewer grate? The start-up was founded by a group of New Haven, Conn. residents with a knack for software engineering, design and entrepreneurship: Jeff Blasius, system administrator for Yale University; Ben Berkowitz, graphic and web designer; and brothers Kam and Miles Lasater, web-savvy software developers. The foursome was inspired to launch SeeClickFix after seeing a similar website, FixMyStreet, based in the U.K. (mentioned in this Newsweek article.) SeeClickFix now boasts about 2,000 users nationwide, according to an interview with co-founder Berkowitz in the New Haven Independent. Lately, the SeeClickFix guys have garnered national media attention. They were profiled by Voice of America (en Espanol). They scored a $25,000 grant from the We Media Pitch It Awards. And last month, they started incorporating its RSS feeds into an experimental “hyperlocal” news site, sponsored by The New York Times, that covers three small towns in New Jersey. Most of the issues are mapped by users in the United States, but a smattering of input comes from as far as Mongolia and India. For now, all the content is in English. Create a “Watch Area” by drawing boundaries around a map and automatically notify yourself or your public officials via email whenever a certain problem arises, i.e. speeding cars, zoning violations, broken crosswalk signals. Become a “SideClick,” or SeeClickFix Ambassador, and spread the word about the free service to people in your community and follow up with local authorities to make sure issues are getting resolved. If you want to get even more involved in the process, you can sign-up for a paid subscription to the “Pro version” of SeeClickFix, which allows you to create a user account, which you can use to manage and track certain issues.